Though you wouldn't often think of 'eye-catching' and 'minimalist' as adjectives that could describe the same fixture, this stunning geometric pendant shows that anything is possible in the world of design. 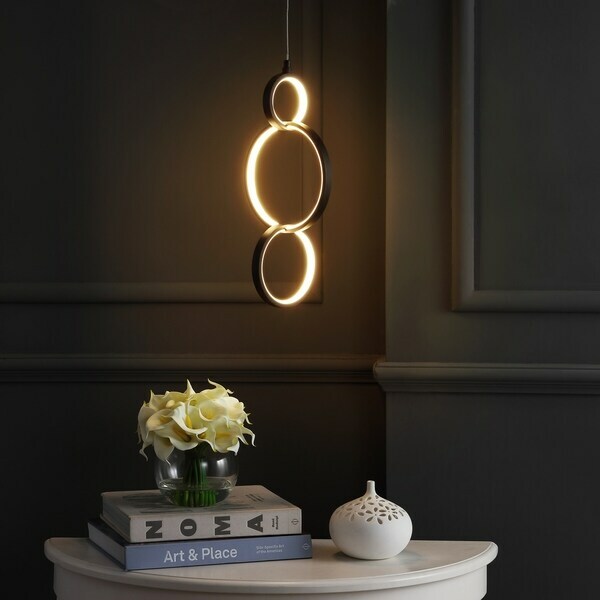 Interlocking LED illuminated rings create a stunning silhouette which looks gorgeous whether featured as an individual or in groups. And for an added designer-quality touch, you can adjust the drop to a length suiting your space -- whether just the rings (19.25') or with cord (up to 91.25'). Dimensions 7.75 In. X 7.75 In. X 17.0 In.